At the end of the day, it’s nearly impossible to avoid every bad food, bad drink, and bad habit out there. That’s as true for your overall health as it is for your oral health. Fortunately, there are plenty of good habits that you can incorporate into your day to day to keep your oral health at its best. But what should you avoid? And when should you be extra cautious to give your teeth a good cleaning? Here’s our list of foods, drinks, and habits that you should be wary of and moderate, in order to maintain and improve your oral health. Coffee and tea (non-herbal tea) are acidic, although tea does have some redeeming factors that are beneficial for your teeth. If you’re a coffee or tea drinker, consider chasing your favorite morning beverage with a tall glass of water. Feel free to swish that sweet H2O around to clear out any acidic liquid that is left throughout your oral cavity. Take note, you should not brush your teeth immediately after drinking coffee or tea, since your enamel will be weakened, and it may be further damaged by brushing in this state. Give your mouth time to rebalance, and give your enamel time to recover before you brush. 30 minutes or more is plenty of time to wait between consuming these beverages and brushing your teeth. These days, we all know the health issues that go hand in hand with tobacco products. Tobacco attacks your oral health, leaving you susceptible to cancer, gum disease, yellowing teeth, bad breath, tooth loss… just about every oral issue in the book. We all know it’s a nasty habit, and it’s one more reason to give it up. Take note, when it comes to your oral health, chewing tobacco is liable to cause all of the same problems as smoking, so neither habit is safe. Most alcoholic beverages are acidic, many alcoholic beverages are sugary, and all alcoholic beverages dry out your mouth. 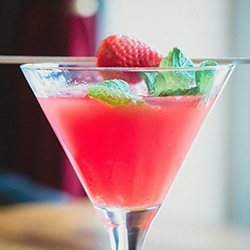 If you’re consuming alcohol, consider following up with a swish and a swig of water. Water will clear away some of the acidity and some of the sugars that these beverages often contain, and it will help your system to naturally produce more saliva, which bolters your oral health and hygene. 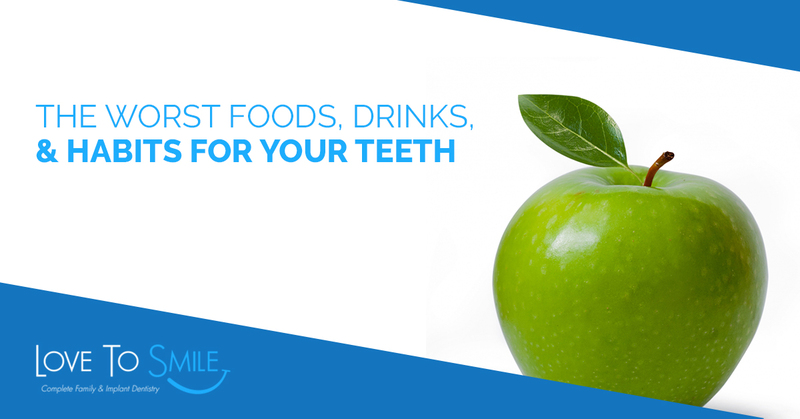 Sweet and sugary foods can harm your teeth. Since these foods are sticky and since they can harbor bacteria as that sugar settles in your mouth, sweets are a nuisance for tooth health. Moderate your intake of sweets (especially those made with artificial sweeteners and sugar), and chase a sweet snack with a veggie (like a carrot), some hard cheese, a glass of milk, or a glass of water. If you grind your teeth, you’re harming them. 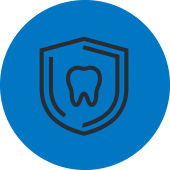 Your teeth rely on a thin layer of enamel to protect the bone-like subsurface that resides underneath the enamel. And unfortunately, when you grind your teeth, you can easily scrape through enamel to the lower layer — which can permanently mar your teeth. Be mindful of grinding your teeth throughout the day if you’re stressed out or if you’ve formed a bad habit, and speak to your dentist if you find that you grind your teeth while you sleep. While chewing ice may seem innocent enough, it can wreak havoc on your teeth. When water is in its crystalline form (AKA ice), it’s surprisingly strong and sharp. While ice is still no match for your jaw, it can cut into tooth enamel, leaving the soft core of your teeth exposed. Acidic foods — including citrus fruits, tomatoes, and other foods — can weaken enamel. Be mindful of these foods, as well as acidic drinks (like sodas), and consider eating a more balanced food to finish your meal. Dairy foods are usually a great follow-up, since they can balance the pH levels in your mouth. Also, consider cleansing foods, like carrots, or wash your meal down with water. This one is a bit of a no-brainer, but poor oral care is a bad habit that can lead to a litany of problems down the line. 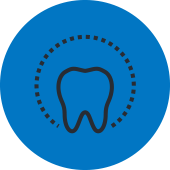 Be sure to brush at least twice a day, floss regularly, and stop by the dentist for consistent checkups and cleanings. 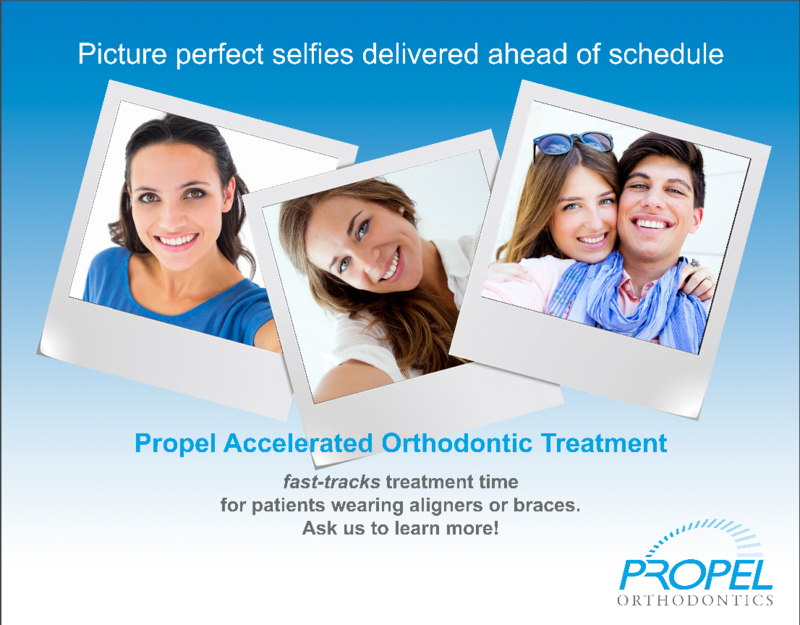 If you’re due for a checkup, feel free to schedule an appointment today. 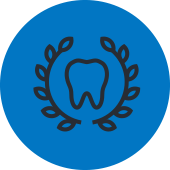 We’re proud to cater to residents in and around Overland Park with our dental services.